The idea of a flood is something that every homeowner fears from time-to-time. While there are things you can do to prevent water damage on your end, natural disasters and other accidents can unavoidably put you in the path of a flood and the resulting water damage. We at PRS of Southern Connecticut in the Shelton area are dedicated to helping you overcome the effects of water damage and then take the necessary measures to hopefully prevent any future flooding. Below are some of the main factors, some in control and some not, that put your home at risk of a flood. The elevation is one of the most important factors which determines the likelihood of your home suffering the effects of flood damage. The lower your home is elevated it is more probable, in general, that water runs off toward it and causes flooding. However, there are other factors relating to the elevation that make your home vulnerable to floods. For instance, being at low elevation coupled with being near a runoff zone for water greatly enhances the odds of a flood. This is obviously a potential source for flooding. You should take into account the rainfall patterns of the area you live in to help you determine what types of preparation you can take against flooding caused by excessive precipitation. A major way you can do this is fortifying your roof. Any weak spots in your roof will be vulnerable to flooding from excessive water or weight pushing down on your roof. Poor drainage in the ground surrounding your home has a major influence upon flooding. However, poor drainage problems can extend far beyond the conditions underground. You can improve drainage around your home by keeping your rain gutter cleaned out and in good order. You can also do this by directing drainage away from window wells and flood-prone areas of your home. The overly saturated soil is a subtle, potentially devastating source of flooding. To prevent this from occurring, you should pay close attention to the moisture levels in the soil surrounding your home. If you notice a significant increase in your soil moisture, you should take more precautions to protect your home against this form of flooding. Unfortunately, there is not much that can be done to stop this once it has begun, but thinking ahead in the construction process by breaking up hardpan and adapting the construction practices to be more favorable to increased drainage. So there you have it. There is a lot you can to be prepared for flooding like have proper drainage near home your home and keeping a close eye on your soil saturation levels. Nevertheless, many of these flood-contributing factors are simply out of your control. 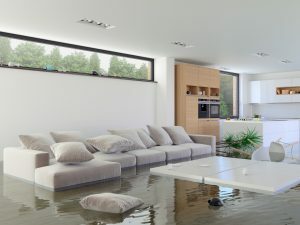 If you ever find yourself unexpectedly suffering from the effects of a flood, don’t waste a moment contacting the pros at PRS of Southern Connecticut in the Shelton area for all your flood damage restoration needs.